Tie the knot in one of the most romantic places in Ireland — we’re definitely not biased. From the rolling hills of Galway’s countryside to the wild coastline, Galway has many beautiful options for your big day. If you’re looking for an all-inclusive wedding venue — somewhere you can have dinner, dance the night away with your friends and family and then fall into bed as the sun comes up — Galway has some beautiful options. You can even walk down the aisle at some of these venues, making your wedding day as seamless as possible. 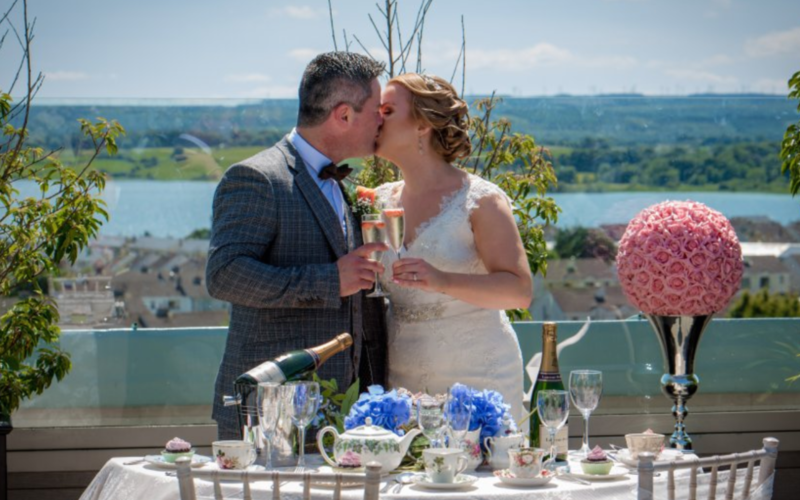 In a beautiful location overlooking Lough Atalia, the Galmont Hotel has all the elements for an unforgettable wedding. Their new 2019 packages start from €58 per person, with their dedicated weddings team and award-winning cuisine to make everything perfect for your day. The iconic and stunning Inis Mór ballroom is perfect for over 180 people; the Veranda Lounge for 80 guests and the Level 5 Lounge can accommodate up to 20 guests. 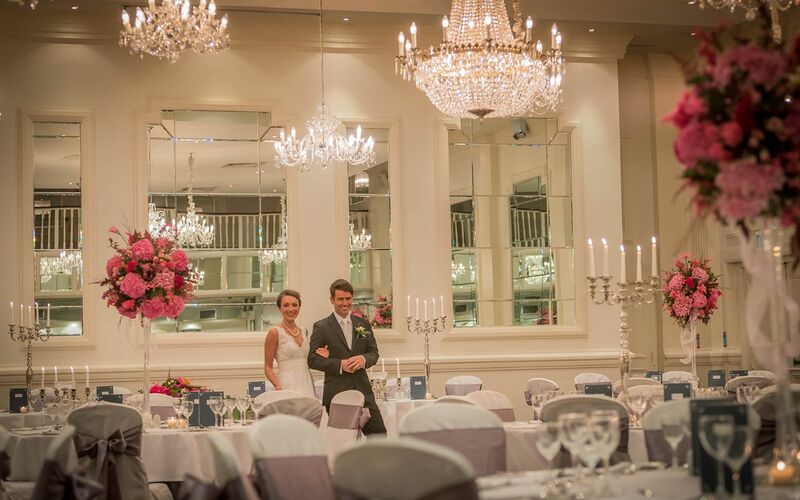 The Galmont Hotel & Spa include a host of extras with compliments, including a sparkling wine reception with canapés, a beautiful fairy light backdrop and curtain entrance and complimentary accommodation for the parents of the wedding couple, options for celebrations day after your special day – to name a few. 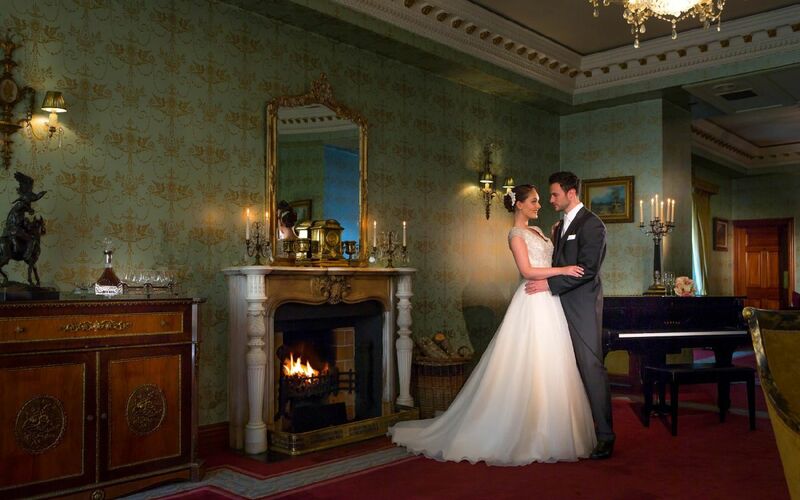 Glenlo Abbey Hotel truly is a destination 5-star wedding venue. Let the beauty of the enchanting lakeside estate overlooking Lough Corrib captivate you. The Glenlo Abbey wedding team are hands -on to ensure your special day exceeds expectations and is a day you will remember. From the Victorian inspired décor of the graceful Ffrench Room to the fairy-tale setting of the beautiful stone-cut restored Abbey, ideal for intimate civil ceremonies, the timeless elegance of the newly refurbished River Room to the grandeur of the Corrib Suite for up to 170 guests, one cannot feel but overwhelmed by the beauty of this magnificent property. Step back in time in the Pullman Restaurant, two exquisite original carriages from the Orient Express, for pre- or post-wedding celebrations to create a truly unique experience for your guests. 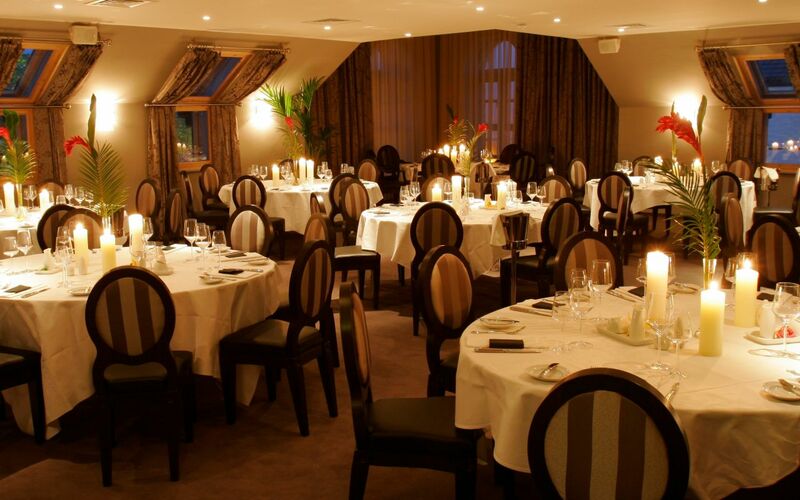 For a boutique wedding, the Harbour Hotel is the perfect venue right in the centre of Galway City. 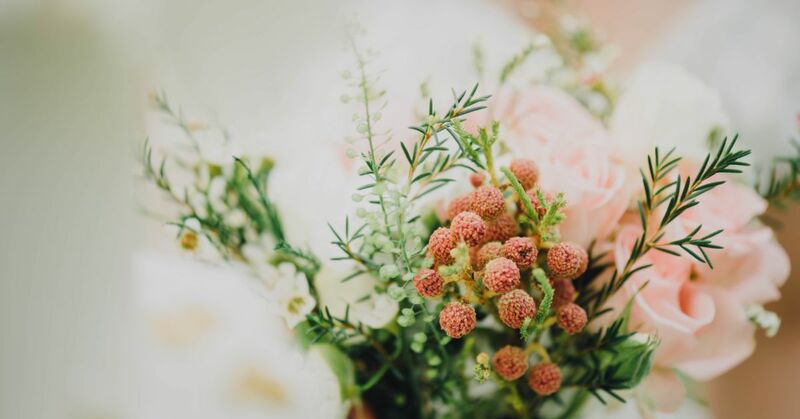 Each wedding reception, civil partnership or religious blessing is treated as a one-of-a-kind wedding with the greatest of care and attention to detail by the experienced and talented wedding coordinator Joanna. Atmospheric and versatile, the Harbour Hotel and Dillisk on the Docks restaurant is the quirky and alternative city centre wedding venue for up to 130 people you have been looking for. The décor in Dillisk on the Docks is a perfect combination of rustic and retro. Whilst the bright, open lobby makes for a wonderful, drinks reception area with social seating and stylish and contemporary décor. Offering bespoke wedding packages to make your special day unique and magical, the Harbour Hotel wedding co-ordinator Joanna will make your wedding day a personal experience to remember. The Oranmore Lodge Hotel, situated only minutes from Galway city, is one of Galway’s favourite family-owned wedding venues. Long-established, the Oranmore Lodge Hotel has built a reputation for luxurious comfort, gracious style and great food. Their most popular packages, the Silver, Gold, and Platinum packages are fantastic value and offer an all-in price from just €45 per guest. Hotel Meyrick has been at the heart of wedding celebrations in Galway since 1852. Standing tall in the heart of Galway City; Hotel Meyrick holds an unrivalled location overlooking Eyre Square. The Meyrick is steeped in timeless elegance, romance, and filled with wonderful history. A winning combination for the perfect wedding, Hotel Meyrick provides the best location in Galway, flexible wedding packages tailored to your needs and an experienced wedding team to advise on all the options available making the organising of your special day a most enjoyable and memorable experience. Your whole wedding experience will be simple and sophisticated, yet always elegant. At Hotel Meyrick you can count on a beautiful wedding setting with exquisite table dressings, personalised assistance, quality Food, and service from professional, attentive and friendly staff dedicated to guaranteeing the satisfaction of your guests. hearts and minds of people. #12is12 Ten minutes from Galway city centre, on the Connemara coast road, The Twelve has 48 boutique style guest rooms, a Petit Spa, its own bakery where breads and pastries are freshly made on site, the amazing artisanal Pizza Dozzina, a Champagne Bar, the lounge bar The Pins, the beautiful private dining room ideal for small, boutique weddings, and the world class West restaurant, focusing on the finest of produce from this bountiful area. West has an exclusive Chef’s Table, along with one of the most exciting wine collections in Ireland. 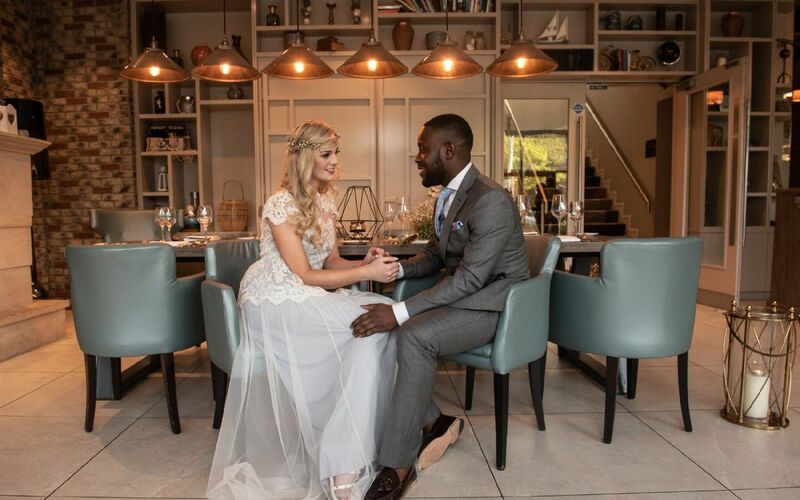 From an intimate family brunch to a sophisticated cocktail buffet to a grand reception banquet, the team at The Twelve, Galway will assist you or your bridal consultant from planning to execution. 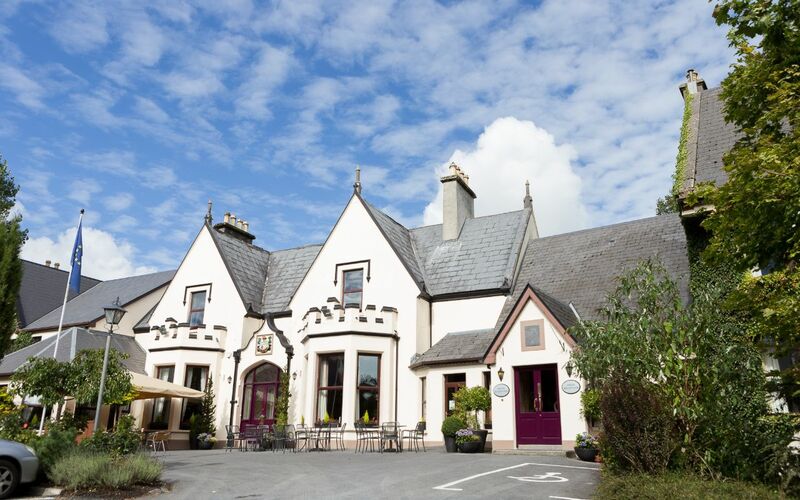 The Lough Rea Hotel and Spa is situated just outside the quaint town of Loughrea overlooking Loughrea Lake for a beautiful wedding. A warm welcome awaits you on arrival to the hotel. Guests can now enjoy the newest addition to the hotel, The Roof Top Garden Bar and sky lounge, which boasts panoramic views of Loughrea Lake and the Galway countryside. The Roof Top Garden is also the perfect place to have a family BBQ the day after your wedding while you relax and unwind on your first day together as husband and wife. The De Dannan Suite is the hotels beautiful ballroom with its own bar. This stunning ballroom boasts Murano glass chandeliers, luxurious velvet drapery, and interchangeable lighting to suite the theme of our wedding. Banqueting tables are dressed in crisp white linen and choose from white or ivory chair covers and coloured bows to suit your theme. Set in an oasis of calm, our exquisite Shore Island Spa promises an experience of complete relaxation and indulgence bridal party packages available for hair and makeup with champagne breakfast. 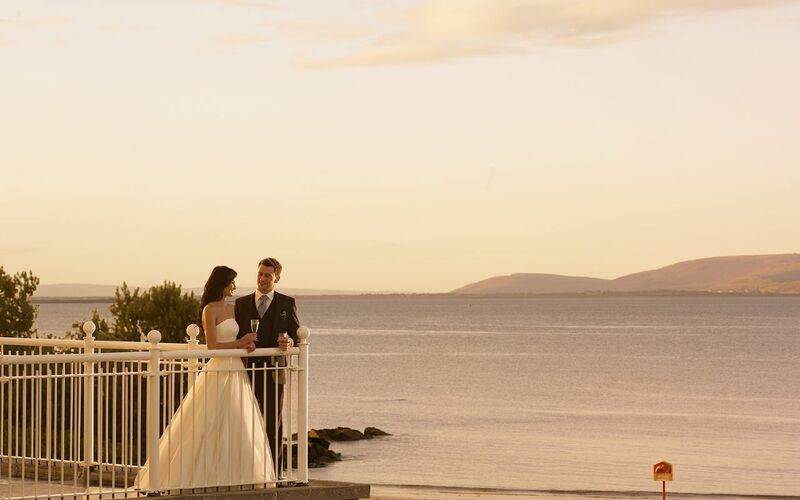 Celebrate your wedding on the edge of the Wild Atlantic Way, with panoramic views of Galway Bay. As you drive along the Salthill Promenade and into the Galway Bay Hote, you know you’ve arrived somewhere special. With stunning views from the terrace and wedding suites, the Galway Bay Hotel can accommodate anywhere from 120 to 400 guests. 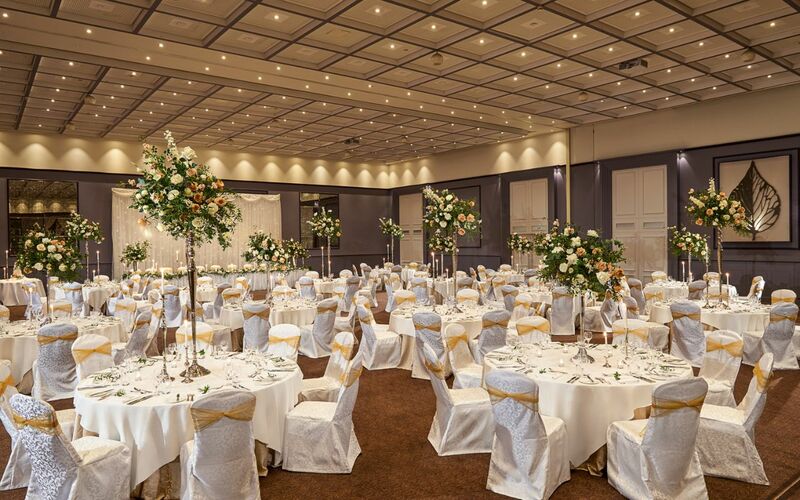 They have two spacious ballrooms to choose from: the Lettermore Suite offers spacious luxury, and the Ballyvaughan Suite offers a more intimate experience. Both rooms are beautifully furnished, with views that showcase Galway Bay and the hills of Clare in all their beauty. They have three lovely wedding packages, which can be tailored to meet your individual needs. The red carpet is rolled out for every wedding, with a champagne reception on arrival for the wedding party — and then it’s really up to you how lavish you’d like your wedding to be. Their wedding team will help guide you through every stage of planning along the way. 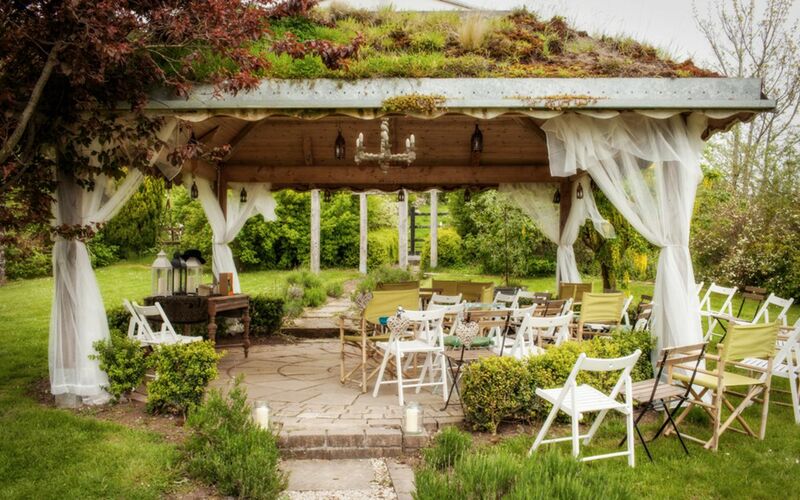 Let nature be the backdrop for your wedding at The Three Towers Eco House and Organic Kitchen in the Slieve Aughty hills. This exclusive venue specializes in small, personal weddings with indoor and outdoor ceremony options, delicious home-made organic food, cosy accommodation and limitless scenic options for photographs. The equestrian centre can even provide a horse and trap for your big day. They aim to make your dreams come true, with all the focus on you for the weekend of your wedding. Highly customisable, they believe if you can dream it they can do it!